Today’s guest post is brought to you by my best friend, Trevor, who recently visited the trendiest bar in the world. Last week I had a chance to visit San Diego for the first time. I was there for a conference, but I also got to take in what the city had to offer, particularly after the conference was over on the last evening. As is my way when visiting a new city, I did a little research beforehand. 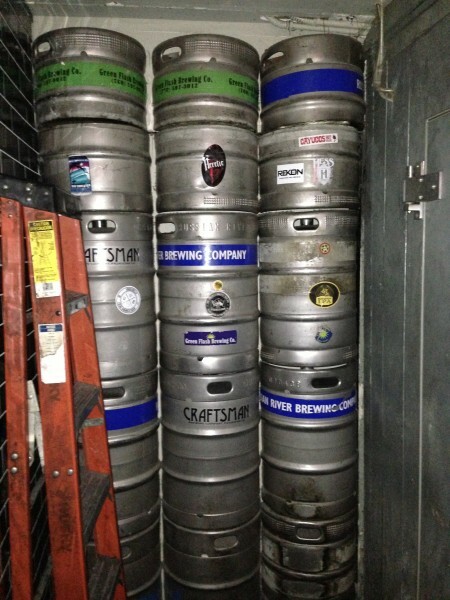 I combed the Internet for reviews of San Diego’s microbreweries, and my research spilled over a little into bars in general. One place stood out above others for its glowing comments and very high rating—a Speakeasy called “The Noble Experiment”. I visited their website and found that all it included was a picture of a key and a phone number. I also learned from the review websites that I had to text the phone number to make a reservation. Intrigued, I did it. On my last night in San Diego I had a chance to go, and it was amazing. I’d heard online that the place was located in the back of a bar called “Neighborhood”. I walked into Neighborhood, but I couldn’t find The Noble Experiment. I was a little embarrassed because I’d brought a few other conference participants with me. We tried walking completely around the building on the outside, but it was to no avail. Determined, I decided to go inside Neighborhood again. 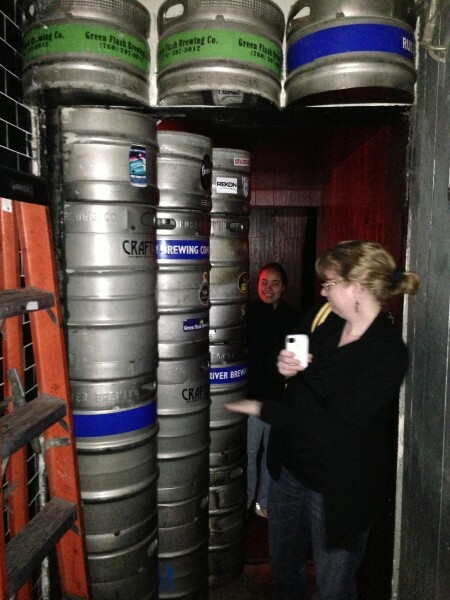 As I walked back to the bathrooms/past the kitchen, I saw a wall of beer kegs, and I remembered that I’d seen a picture of a wall of beer kegs from a review online. I pushed on the wall, and a door opened into a secret backroom! I was greeted by a tastefully tattooed hipster lady, who took me into a small room that included 3 plush booths and a small bar. The place was awesome. One wall was made entirely of skulls (and backlit to provide a chic, mellow mood). The ceiling was covered with portraits of old English people. Another wall showed a gaudy picture of a neon deer that would wink at you now and again. It’s hard to describe, but the ambiance was palpable. My small party was led to one of the plush booths, and we were given a short but creative drink menu printed on parchment paper. They only serve mixed drinks. At the bottom of the menu, I saw something called “dealer’s choice,” which was highly recommended in online reviews. Everyone in my group went that route. Basically, with the dealer’s choice option, a bartender comes to your table and has a conversation with you about what you like (name a liquor or two that you like, for instance, and they’d go from there). The bartender then leaves and comes back with something creative for each person. Everyone loved their drinks; they were all strong, but all very tasty! The Noble Experiment could easily have packed their small room with tables and standing-room-only reservations, but that wasn’t the point; there were never more than about 20 people in the place at any given point. As I sat in the comfortable, stylish booth with my whiskey-based drink that incorporated apple brandy, two types of bitters, and a handful of other things I can’t remember, I looked up at the other people who had texted their reservation, found the wall of kegs, and peered into the winking eye of the neon deer. As we paid our bill to leave, each check was accompanied by a small journal filled with the thoughts, quotes, and quips of previous customers, and the check was tucked into the first blank page. I left a Shakespearean quote for our bartender as a suggestion for her next tattoo (she already had one quote from the poet tattooed in a not-quite-necklace around her left collarbone). Have you ever been somewhere and realized that it was probably the coolest place you could possibly be at that moment? If so, where? This entry was posted on Wednesday, June 12th, 2013 at 10:17 pm	and is filed under guest entry, restaurants and tagged with restaurants. You can follow any responses to this entry through the RSS 2.0 feed. I haven’t been to anywhere near as cool as this bar sounds, but just a few weeks ago I was introduced to a somewhat similar location right here in St. Louis. As far as I know there aren’t any passwords required to get in, but there is a restaurant/bar close to downtown in the garment district where you have to be a member to attend (and make reservations when you want to go there). I was fortunate that a friend happened to be a member there, and it made for a nice place to spend a few hours of conversation over a couple of cocktails one evening. This place is one that doesn’t have a sign out front, and the entrance is not on any main thoroughfare (I think the “front door” was actually in an alley), and it felt very much like we were at a Speakeasy. Sometimes I drink alone at my place and try to convince myself that it’s the most exclusive joint in town.